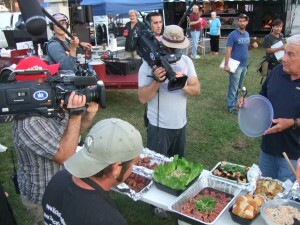 The pressure’s on as the Pitmasters compete in one of the most difficult cook-offs of the year – the Murphysboro Barbecue Cook-off. 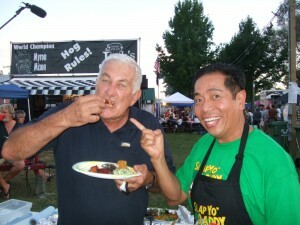 Lee Ann and Myron face off in the whole hog competition while tempers flare between Johnny and one of the local competitors. Also, Harry Soo makes soo-shi?!? Lee Ann tries to take down Myron “I’m the damn king” Mixon with a little southern hospitality. 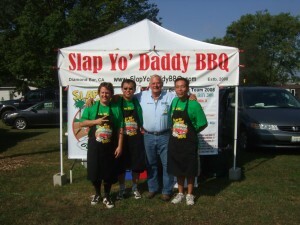 The pitmasters compete in the grand daddy category of The Whole Hog. 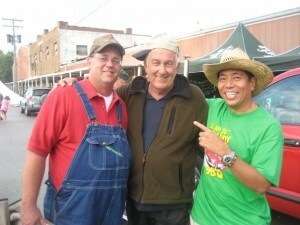 We try our hand at a Memphis BBQ Network (MBN) sanctioned contest on top of cooking a regular KCBS contest. The MBN is unique as there are three on-site judges you have to impress. We also have to decorate our cooked meat on our pit. I get everyone to participate in a Pitmasters Potluck. 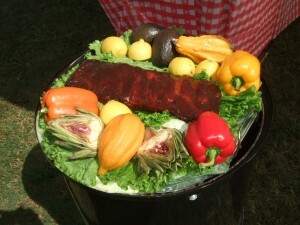 There were some amazing dishes as the Pitmasters are all great cooks in their own right. I made my signature Seared Ahi w Maui Onion Dressing and Spanish Seafood Paella, both which got some airtime. I even got Johnny of Smokin Triggers to eat raw fish for the first time and it’s captured on camera! There were lots of folks who had too much to drink and moonshine so watch the Episode as a drunk tries to tangle with Johnny. It’s rumored Johnny has a gun tucked in his Texas boots. Not good to find that out the hard way! We had a blast and came in 4th overall in the MBN rib entry with all three on-site judges awarding us perfect 10′s in presentation. No bad for our first MBN contest with the new rules and the best of the best MBN teams out there! In the KCBS, we did 18th overall; 11th chicken, 16th brisket, 24th ribs, and 29th pork. Johnny having soo-shi first time!